The disciples likely had a sinking feeling in the pit of their stomachs. The Messiah had just prophesied of the Temple’s complete and utter destruction. Things were becoming terribly discouraging. Jesus had already begun to tell them of His coming torturous death at the hands of the Romans. He told them that He would rise from the dead three days after His death, but that thought seems to have been swallowed up in the anxiety and fear that was overcoming the disciples. How would they make it out of this? And the Temple – it would be destroyed? With great dread the disciples enquire of their Master when these things would happen, and what sign they would have of His coming and of the end of the world. Jesus said in verse 24 that Jerusalem would be “trodden down of the Gentiles, until the times of the Gentiles be fulfilled.” What does this mean? In the centuries following the siege of 70 A.D., the country would be basically desolate for hundreds of years. After 300 years of Byzantine rule, in 638 the Holy City was placed within Muslim control by Omar Ben Hatav. In 1099, it passed into the hands of the crusaders. It moved from the control of the Mongols, to the Turks, and then to the British on December 9th, 1917. That is an amazing story in and of itself, when general Allenby conquered Israel for the British and walked into Jerusalem on foot without a single shot being fired. On May 14th, 1948 the National Council of Tel-Aviv announced the State of Israel would now be an independent nation among the nations of the world. The very next day, the British relinquished their control over the nation. Soon after, however, war was waged against God’s chosen nation. Arab armies recaptured the old city. It was then taken by Jordan and held until 1967. It was then that the old city was recaptured during the “Six-Day War” by the Israeli army. When this occurred, many Bible students began to believe that the “times of the Gentiles” were over! 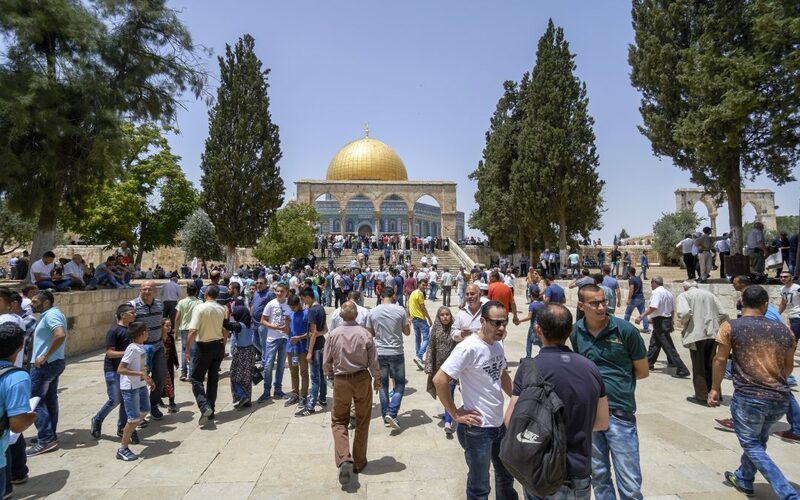 This, however, was not God’s timing for the fulfillment of the “times of the Gentiles,” and Israel’s secular government turned control of the Temple Mount back over to the Muslims. This is the situation Jerusalem finds herself in today. Right now, we are in the “until ” part of Jesus’ phrase. Ever since the Roman expulsion of the Jews from the Holy City in 70 A.D., Jerusalem has been, and is currently, “trodden down of the Gentiles.” To put it plainly, Jerusalem has been under Gentile control from 70 A.D. unto today. Jesus’ phrase “Jerusalem shall be trodden down of the Gentiles” leads us to believe that He was speaking of a future event that had not yet occurred. There is an undeniable connection between the prophecy in Daniel 9:26 & 27 of Jerusalem’s destruction after the Messiah’s death, and Titus besieging the city in 70 A.D. The above passage is telling us that the non-Jewish peoples of the world will retain some form of control over at least a portion of the Holy City, until “the times of the Gentiles” are complete. The beginning of the Tribulation period draws closer, and the rapture of the church (which precedes it) is imminent. This 7-year period also know as “Daniel’s 70th week” will begin with the signing of a peace treaty orchestrated by the Anti-christ. We know that the Temple will be standing by the middle of the Tribulation for the Anti-christ to enter in, cause the sacrifices to cease, desecrate it, and claim himself to be God. This does not mean that “the times of the Gentiles” would then end with the signing of the peace treaty, the building of the third temple, or with the occurrence of the rapture. The Luke passage at the beginning of this article has been erroneously applied to the timing of the rapture of the church. The culmination of this time period is not the rapture, but rather the second coming of Jesus. At the time of the signing of the peace treaty, Jerusalem will be passing control from a group of Gentiles to a specific Gentile, namely the control of the Anti-christ. This is speaking of the mid-point of the 7-year Tribulation period. Those 42 prophetic months also constitute 1,260 days, or 31/2 years. This is the same 42 months that we read about in Revelation 13:5, which tells us that the Anti-christ has power to continue in his wickedness for 42 months. When will those 31/2 years come to an end? When will the “times of the Gentiles” be over? When Jesus the Messiah returns to earth at the end of the 7-year Tribulation period. He vanquishes the Anti-christ and the armies that have set themselves against Jerusalem, and sets up His millennial kingdom on this earth. Then “the times of the Gentiles” will finally be fulfilled! Great article Bro. Dan! I was taught that the beginning of the Times of the Gentiles began in the 6th century B.C. with the Babylon/King Nebuchadnezzar captivity and destruction of Solomon’s Temple. Excellent and clear explanation of the reasons why the 6th century B.C. was not the starting point and 70 A.D. was the starting point. It’s obvious that the Second Coming of Christ will end the Times of the Gentiles. Jesus Christ will have conquered Israel’s enemies and judged the nations. He will be ruling the world for 1,000 years in Jerusalem. Amen! Praise the Lord! Thank you for your comment!